I recently came across the story of Major Walter Summerford who was a British officer in the early 1900’s and he fought in World War I. While galloping through a field in Belgium he was struck by lightening. One would think that one lightening strike would be more than enough for one lift time, and for the most part you would be right. But in the case of Major Walter Summerford, this was only his first encounter of the mass voltage from the sky. After Walter’s initial injury sustained from the lightning blast, he was forced to retire early because for a time he was paralyzed from the waist down. He relocated to Vancouver Canada where he began to enjoy early retirement with outdoor activities such as fishing. On one such day in 1924, he took fishing pole and bait in hand and set off towards his favorite fishing hole. He perched (no pun intended) himself under a tree and began fishing…unfortunately the tree that he had decided to sit under destined for…yes, you guessed it, a lightening strike. Major Walter Summerford was struck by lightening once again. Initially Major Summerford was paralyzed on one side of his body, but remarkably, after two years of healing he recovered from his injuries. One would think that being struck, not once, but twice by lightning it could never happen again, but the remarkable thing is it did. Major Summerford was walking one evening in town when another bolt of lightning crashed from the heavens and, defying the odds, found its mark on the body of poor Major Walter Summerford. This time the lightning strike proved lethal and Major Summerford eventually succumbed to his injuries. One would think that this is the end of the story, but unfortunately it is not. The body of Major Walter Summerford was then interned at Mountain View Cemetery in Vancouver. For four years his body was undisturbed until the spring of 1936 when his gravestone was once again struck by lightning. How could one be so unlucky some might ask. I find this story quite fascinating. We read of people and the trials that they have gone through and we wonder how they could ever overcome these difficulties. Some of us reading this right now have gone through or are currently going through difficulties and there are moments when we wonder if we will survive this (whatever ‘this’ is). Our journey through the valley of the shadow of death isn’t always death itself. Sometimes it’s financial concerns. Other times it’s stress at work, or difficult coworkers, or problems with your children. We all find ourselves here in this valley. It’s almost as if we’ve been struck by lightning again and again and we wonder “Lord, why?” and then wonder if it could get any worse…and sometimes it does. I know at this point it may not sound very encouraging, but bear with me. We all go through the valley of the shadow of death. We all experience terrible, horrible, no good very bad days. We all wonder in times of great trial if God is really there with us, or if we can possibly handle another strike of lightning. I am here to tell you that we can all make it through these dark times. You aren’t alone in this journey. It may feel as if you have been, but you’re not alone. They had been through some very difficult things, many of the younger generations could only remember being slaves in Egypt. They had lived in this valley of the shadow of death all their lives. Imagine experiencing your terrible, horrible, no good very bad day – EVERY DAY?! The same God who promised that His presence would go with the Israelites also promises to go with us, and even in our times of trial He will provide us with the rest that we so desperately need. 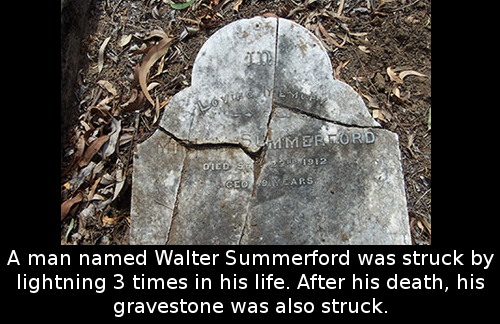 Do you feel as unlucky as Major Walter Summerford? Does it feel like you’ve been kicked while you have been down? I know at times it doesn’t seem fair and it is easy to become bitter and angry at your life’s circumstance, but remember that God is very near and He will never leave you or forsake you. Lord, help me today in my stress and in my trials. You know my breaking point, and my struggles. Remind me when I feel all alone in this fight that I am not alone. Cleanse my heart from all bitterness and unrighteous anger. Guide me in my dark valley of the shadow of death and restore my soul. In your name I pray these things. Thanks for this amazing, unbelievable story of living proof of God’s power.